For a fresh complexion that feels reborn, avocado oil and jojoba beads marry to lift away lifeless skin. Healing marigold bloom oil works to nurture and repair. Carrot seed extract helps clear and revitalise your skin`s surface. Aqua (water), kaolin, Prunus armeniaca (apricot) oil, Buxus chinensis (hydrogenated jojoba) wax, glycerin, glycerol stearate, cetearyl wheat straw glycosides, cetearyl alcohol (coconut derived), titanium dioxide, tocopherol (Vitamin E), Persea gratissima (avocado) oil, Calendula officinalis (marigold flower) oil, Daucus carota sativa (carrot seed) oil, Vitis vinifera (Vinanza Grape® grapeseed) extract, gluconolactone, sodium benzoate, calcium gluconate, essential oil fragrances of cedarwood & sweet orange: d-Limonene+, citral+, linalool+. + Component of essential oil. 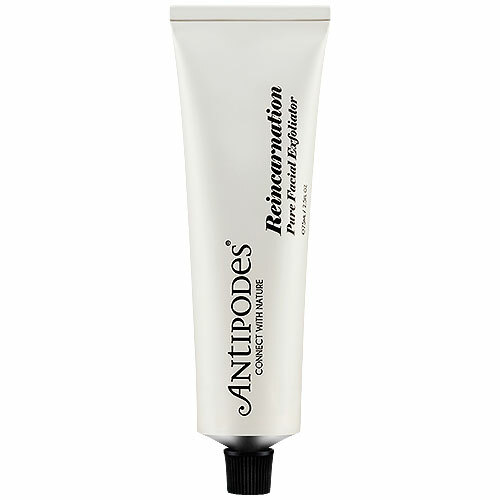 Below are reviews of Antipodes Reincarnation Pure Facial Exfoliator - 75ml by bodykind customers. If you have tried this product we'd love to hear what you think so please leave a review. Avocado oil and jojoba beads marry to lift away lifeless skin, leaving a fresh complexion that feels reborn.